Got some super important, time sensitive news you want to make sure is seen by all subscribers? We've got you covered! You can have an article appear in all newsletters for a specific period of time using our Distribution Settings. To access Distribution Settings, go to your Content Manager, click on your Content Icon of choice, and then find the yellow gear at the top right hand corner of the screen. This will prompt a sidebar to appear with various settings for you to control. The first option is Priority Settings. Here, you will find three choices on how content can be sent out. The second two options are what you should focus on to send your content to all subscribers. You can either choose to have this article sent to everyone at some point in their newsletter or send it to all subscribers as their first story. Both of these options will prompt the question of how many times you would like the article to appear in everyone's newsletter. 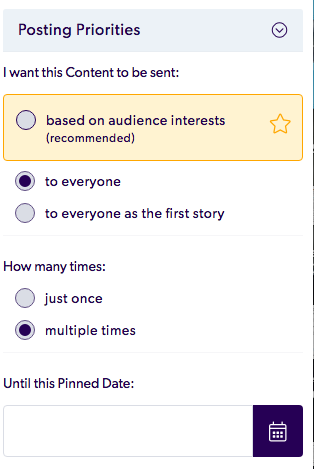 If you choose multiple times, you will be able to select a Pinned Date. This will allow you to choose until what date you would like the article in appear in all newsletters.